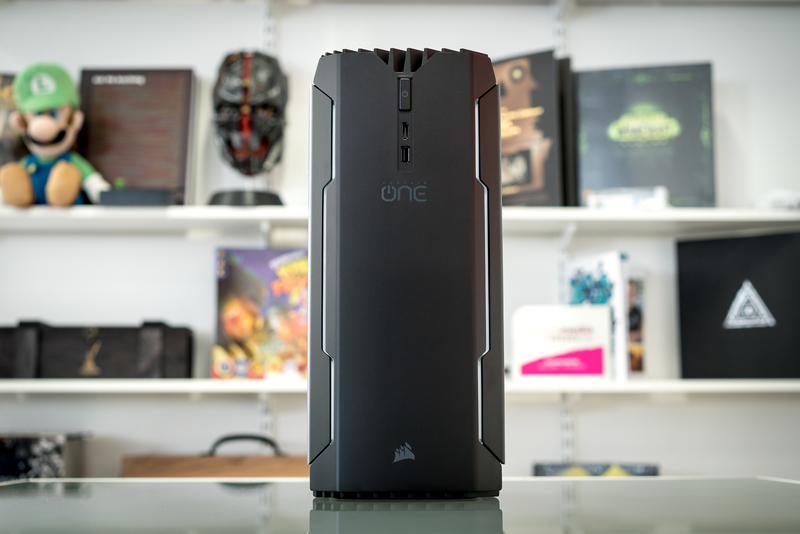 It’s hard to believe that the Corsair One comes from the same company that designed the Bulldog, a small form factor PC so monstrously ugly that the mere thought of placing it in a living room was enough to set off a spousal gag reflex. Where the Bulldog was a confused mishmash of jaunty, l33t gamer angles, the One is sleek, sophisticated, and—dare I say it—even a little grown up. That Corsair continues to sell a slightly updated version of the Bulldog is something of mystery considering just how good the Corsair One is. Of all the small form factor (SFF) PCs I’ve tried—and there have been quite a few over the past year—it is by far the best. I’d even go as as to say it’s one of the best pre-built PCs you can buy, full stop. At £2,300 for a fully loaded version, the Corsair One isn’t cheap by any means—and as always, going the DIY route can lead to substantial savings—but few homebrew PCs have such a tiny footprint. Fewer still do so while being entirely liquid cooled, graphics card and all. It’s a combo that results in a PC that doesn’t just fit into the living room environment aesthetically, but acoustically too.